Perfect Timber Partnership’s Billy’s Star closed late on the far outside to win Sunday’s co-featured $140,250 Victoria Park Stakes at Woodbine. Trained by Roger Attfield, the son of Perfect Soul (IRE) arrived at the 1 1/8-mile ‘Poly’ event from a third-place finish in a 1 1/16-mile allowance race on the E.P. 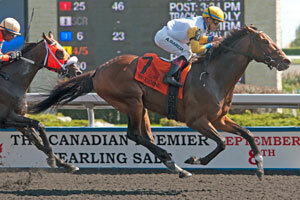 Taylor Turf Course, using the extra sixteenth of a mile to secure his first stakes win. Bring on the Bull was the early pace setter, posting fractions of 24.33 and 48.68 as both Conquest Pacemaker and U S Marshal pressed throughout. With Eurico Rosa da Silva on board, Conquest Pacemaker made his move at the quarter pole, taking over the lead up until the final eighth of a mile. But there was no denying Billy’s Star, last of six for most of the running under Alan Garcia, who rallied five-wide late in the turn and swooped to a 1 ¼ length victory. Firespike arrived late for place money, a length in front of Conquest Pacemaker. Billy’s Star covered nine furlongs in 1.51.42. Attfield had confidence in the improving bay, providing Garcia, riding Billy’s Star for the first time, with perfect pre-race instructions. Billy’s Star was bred in Ontario by part owner Charles Fipke. He is a son of Perfect Soul (IRE), out of a Seeking the Gold mare, Tapatina. He banked $90,000 in victory, bringing his lifetime earnings to over $197,000. Billy’s Star paid $7.60, $3.50 and $2.30 combining with Firespike ($3.70, $2.30) for a $19.20 (7-6) exactor. A 7-6-4 triactor (Conquest Pacemaker, $2.10 to show) paid $50.20. Conquest Cobra was scratched.